For other uses, see Battle of Mir. 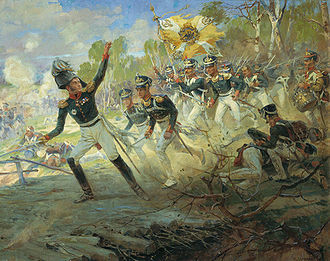 The Battle of Mir took place on 9 and 10 July 1812 during Napoleon's invasion of Russia. 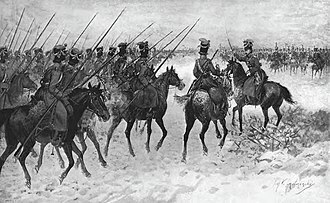 Three Polish Lancers divisions battled against Russian cavalry, ending in the first major Russian victory in the French invasion of Russia. 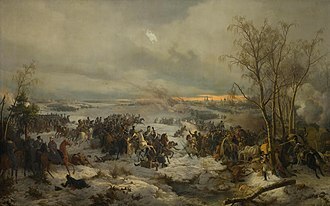 Russian general Matvei Platov had eight Cossack regiments and two Don batteries deployed south of the village of Mir, when one brigade of the Polish Fourth Light Cavalry attacked his advance posts, numbering about 100 men. These advance posts had the dual job of both observation and sentry duty, and to entice the enemy to attack; ambushes of a hundred men each were set up farther down the road to Mir, on either side of it. 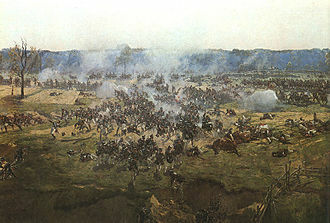 The Polish general Alexander Rosniecki's forces clashed with Russian Alexander Vasilchikov's cavalry, resulting in hand-to-hand combat with fairly even losses. 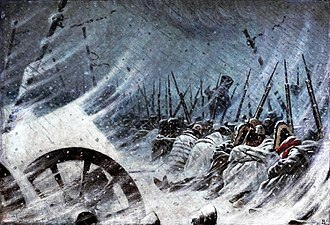 Followed by Uhlans, they swept through the village, attacking Platov's main force. 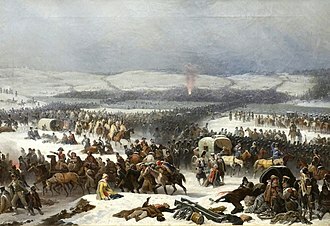 A third Polish brigade attempting to join the fight was encircled and broken by Cossacks, after which the entire Polish force gave ground, driven back with the aid of Russian Hussars, after the arrival of Vasilchikov's Akhtyrka Hussars, Dragoons, and other reinforcements, the battle raged for six hours, shifting to the nearby village of Simiakovo. 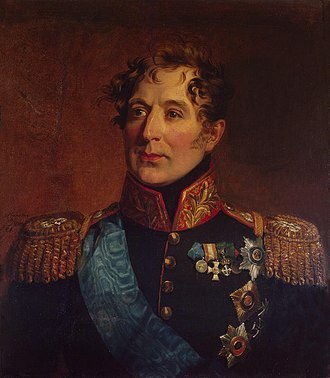 Platov defeated the enemy there, and moved on to Mir, where he inflicted further losses on the enemy before tactically withdrawing. A complete rout was only averted by Tyszkiewicz's brigade, which covered the Polish retreat. 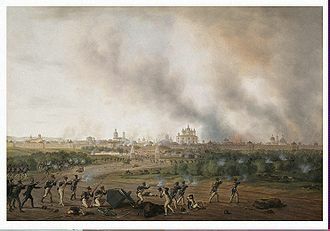 The town of Mir and fort ruins were used as a headquarters by Jérôme Bonaparte, until he decided or had to leave the army, after a quarrel with his brother on 6 August 1812, after retreating, the Mir Castle was destroyed with gunpowder. ^ Journal of the Military Service Institution of the United States, Volume 19. 1896. ^ a b Foord, Edward A. 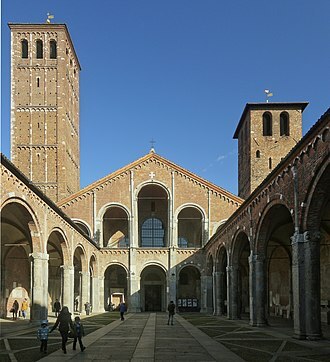 (1915). 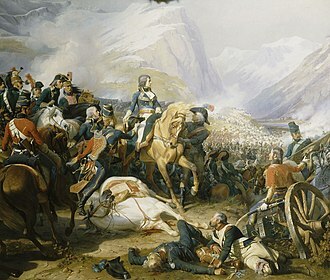 Napoleon's Russian campaign of 1812. Little, Brown and Co.
^ Davies, Norman (1998). Europe: a History. 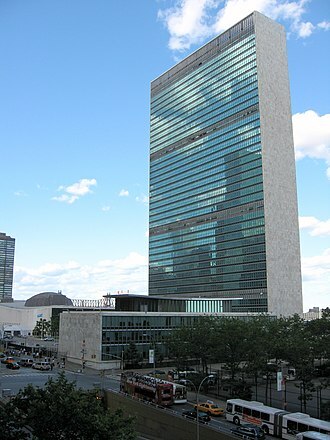 HarperCollins. 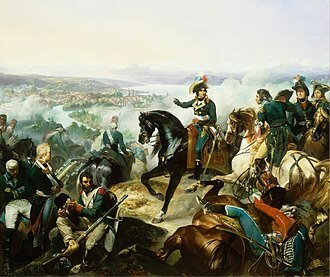 The Battle of Tarutino was a part of Napoleons invasion of Russia. 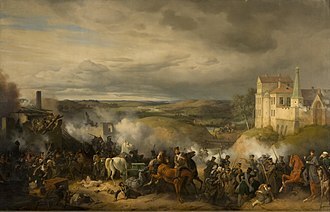 The battle is called the Battle of Vinkovo or the Battle of Chernishnya after the local river. 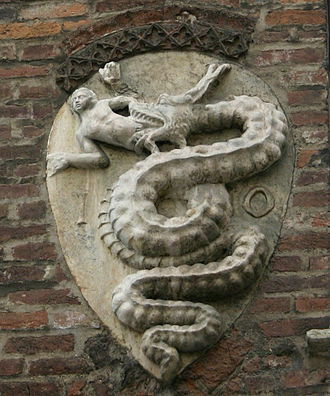 Many historians claim that the name is more fitting because the village of Tarutino was 8 km from the described events. 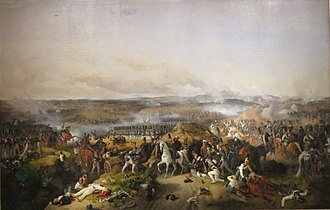 In the battle Russian troops under the command of Bennigsen defeated French troops under the command of Joachim Murat, after the battle of Borodino, Kutuzov realized that the Russian army would not survive one more large engagement and ordered the army to leave Moscow and retreat. 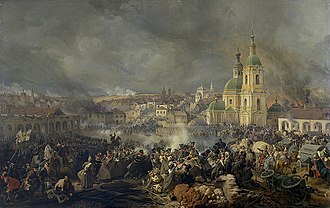 At first it retreated in the south-east direction along the Ryazanskaya road, when the army reached the Moskva it crossed it and turned to the west to the Old Kaluzhskaya road. 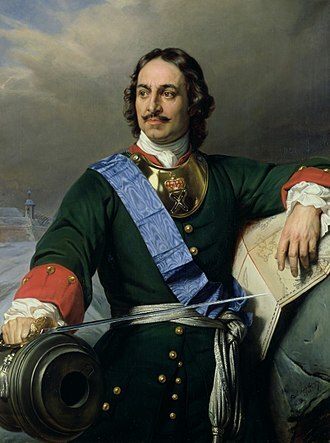 The army pitched camp in a village of Tarutino near Kaluga, at the same time small units of Cossacks continued moving along the Ryazanskaya road misleading French troops under the command of Murat. When he discovered his error he did not retreat but made camp not far from Tarutino in order to keep his eye on the Russian camp. 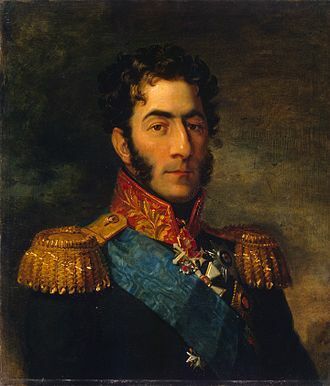 On 18 October 1812 Kutuzov ordered Bennigsen and Miloradovich to attack Murats corps with two columns stealthily crossing the forest in the dead of night, bennigsens main column included three columns led by Vasily Orlov-Denisov, Karl Gustav von Baggehufwudt and Alexander Osterman-Tolstoy respectively. The other column was supposed to play an auxiliary role, in the darkness most of the troops got lost. 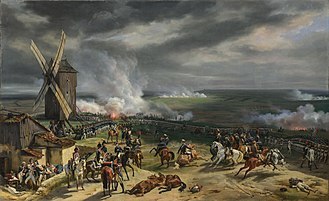 Since other Russian units came late the French were able to recover, when the Russians emerged from the forest they came under French fire and suffered casualties. 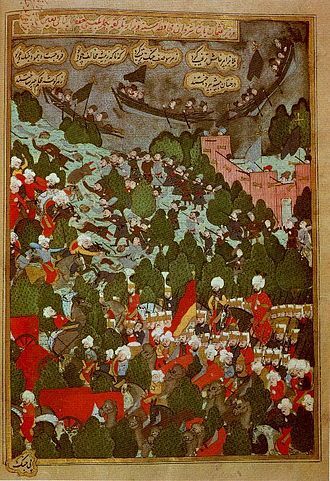 Murat was forced to retreat to escape being surrounded, the French forces suffered 2,500 dead and 2,000 prisoners, the Russians lost 1,200 dead. 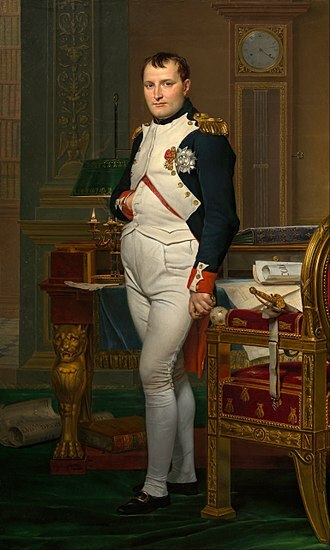 The defeat infuriated Napoleon, who felt the retreat following the loss would appear to the world as though he had been defeated. 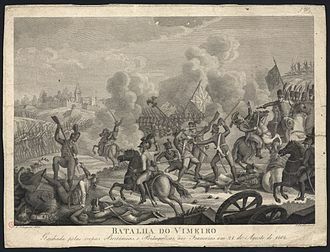 The total number of cannon captured by the Russians at Tarutino—38 pieces in all—was noteworthy because until this point in the war and this was regarded by the Russian rank-and-file as a sign that the tide of the war was finally turning in their favor. Uhlans were Polish light cavalry armed with lances and pistols. The title was used by lancer regiments in the Russian, Prussian. 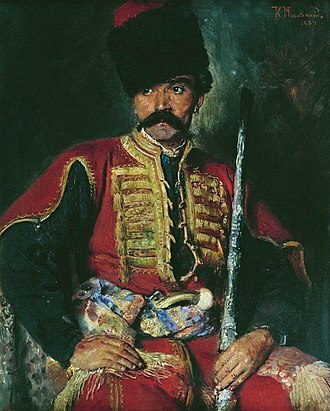 Uhlans typically wore a jacket with a coloured panel at the front, a coloured sash. This cap or cavalry helmet was derived from a design of Polish cap, made more formal. Their lances usually had small, swallow-tailed flags just below the spearhead, in the Turkic Tatar language, it means, amongst other things, a brave warrior or young man. The Kalmyk/Oirat/Dzhungar cavalry made wide use of lances both in European as well as Central Asian wars. One of the members, Colonel Aleksander Ułan, was the commander of a Polish light cavalry regiment in the service of Polish-Saxon kings, August II Mocny. After Ułans death his regiment was nicknamed Ułanowe dzieci and Ułanowe wojsko, prior to 1764, all Polish-Lithuanian Tatar cavalry regiments in Saxon service were named Ułani. 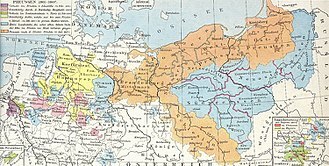 Once the Golden Horde Tatar families had settled in Lithuania in the late 14th century, they were required to military service for the Grand Duke of Lithuania. The Poles started incorporating much of their vocabulary and many of their traditions, along with their strategy. Lithuanian Tartars, mostly Muslim, served as part of the Royal armies during various battles of the late Middle Ages and their tasks were to conduct reconnaissance in advance of the heavier cavalry banners. The last Polish King, Stanisław August Poniatowski, had a Uhlan guard regiment simply known as the Royal Uhlans and it was disbanded in 1794 or 1795. The first Uhlan regiments were created in the early 18th century in Polish–Lithuanian Commonwealth in 1720s and their speed and mobility were key to their popularity. The Uhlan regiment formed by the Kingdom of Prussia in 1740, the regiment failed to distinguish itself favorably in the first of the Silesian Wars and was disbanded shortly afterwards. In 1745, engaged in a union with the Polish-Lithuanian Commonwealth. Shortly after, the Marechal de Saxe created a Polish Ulan regiment for the French king, King Stanisław August Poniatowski of Poland formed a regiment of royal guards equipped with lances and pistols, each guardsman uniformed in kurta and czapka. Chasseur, a French term for hunter, is the designation given to certain regiments of French and Belgian light infantry or light cavalry to denote troops trained for rapid action. 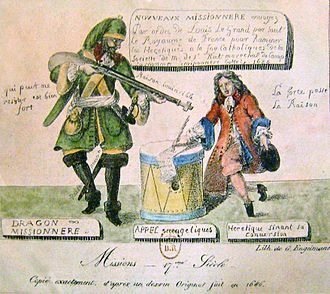 During the remainder of the 18th century various types of troops were employed within the French army. The chasseurs à pied were the light infantrymen of the French Imperial army and they were armed the same as their counterparts in the regular line infantry battalions, but were trained to excel in marksmanship and in executing manoeuvres at high speed. From 1840, they wore a frock coat. 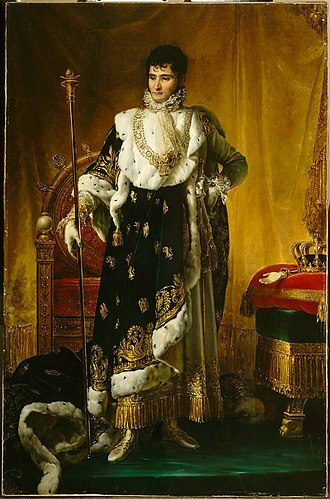 After 1850, however the chasseurs adopted a uniform consisting of a frock coat with slits in the sides on the bottom edge to allow for better freedom of movement than the previous design. They wore light blue baggy trousers tucked into jambières, the other light infantry unit type, the voltigeurs, specialised as skirmishers and for advance screening of the main force. 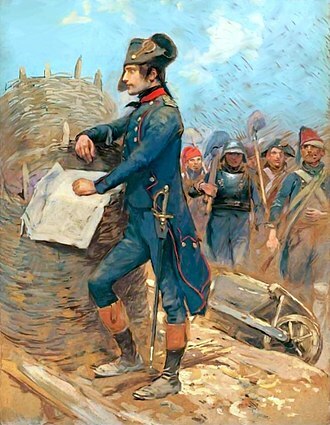 The chasseurs could be called upon to form advance guards, following the Napoleonic Wars the chasseurs à pied continued to exist as a separate corps within the infantry. Initially a specially trained elite, their tactical role eventually came to match that of the ordinary lignards, by the late 19th century the differences between the two branches were confined to uniform and insignia, although the chasseurs retained a strong esprit de corps. However public opinion, influenced by the occasions on which the chasseurs had distinguished themselves during the war was opposed to the disbanding of this distinctive corps, under the Third Republic the chasseurs à pied were increased from 20 to 30 battalions. Of these, four saw service in Tunisia, one in Indochina. Twelve of the battalions were re-designated as mountain infantry. The remaining chasseur battalions were deployed near the frontier with Germany as part of the troupes de couverture, during World War I the French Army maintained 31 battalions of infantry chasseurs plus a varying number of reserve and territorial units. Each infantry division was expected to include at least one battalion of either chasseurs à pied or chasseurs alpine, each battalion had an establishment of 1300 to 1500 men. The Charging Chasseur by Théodore Géricault, depicting an officer of the Chasseurs à Cheval de la Garde Impériale.